[PureInsight.org] Nearly 10,000 practitioners from 53 countries attended the New York Falun Dafa Experience Sharing Conference on May 15. 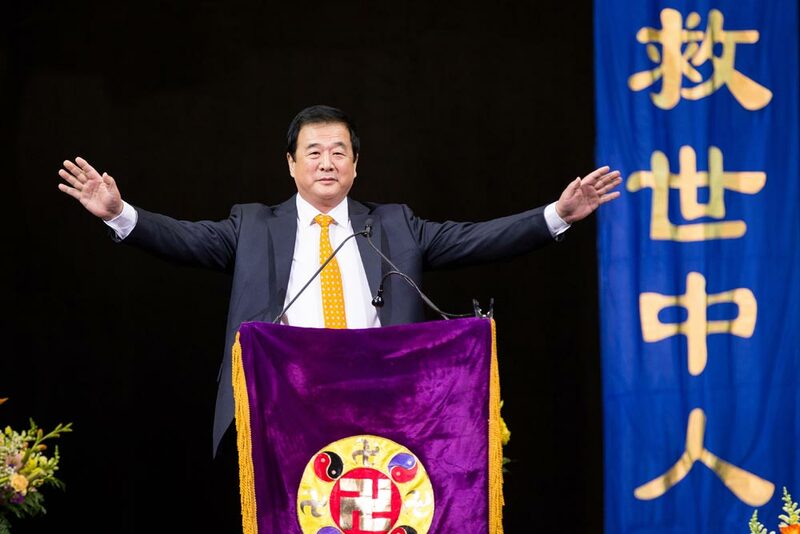 Mr. Li Hongzhi, the founder of Falun Gong was warmly welcomed. He lectured and answered questions for over two hours. The 2016 New York Falun Dafa Experience Sharing Conference was held at Barclays Center, New York. At around 11:20am, Master Li came onto the stage accompanied by an enthusiastic standing ovation. He greeted the attendees by waving his hands and saying, “Greetings everyone! You have been working hard!” Practitioners responded together, “Greetings Master! Master is working hard! " Such presentations on China’s human rights caused incredible repercussions. Some communities took the initiative in requesting their MP to sign the 343 resolution (the U.S. Congress condemned the CCP’s organ harvesting from living Falun Gong practitioners). Some associations invited Chen Wen to join their meetings with MPs. One audience member from her presentation told her, "Although we have only 70 people here to listen to you, we are community leaders and represent at least 3,000 people..."
Chen has two kids and a full time job. She gets up at 3am every morning to practice the exercises and study Zhuan Falun. Then she prepares breakfast and lunch for the kids at 6:30am. About 7:15am, she sends them to school, and then goes to work. After dinner, she studies Fa with her kids and does Dafa projects until 10pm. Wang Lijing from Italy began to practice in 2008. The CCP's inhumane persecution made her shudder. She decided to make phone calls to China to ease the pain of imprisoned mainland Chinese practitioners. In fact, before the persecution started in 1999, the whole society had accepted Falun Gong. You could hear people everywhere saying, “Falun Dafa is good! Truthfulness, Compassion and Forbearance are good!" The CCP’s investigation has also confirmed this. She said, "Master has helped so many paralyzed patients recover and walk normally and many incurable patients in hospital have also become absolutely normal.” Bystanders listened attentively; some nodded, and no one left. Some who were listening asked for truth clarification materials. Others asked her to continue talking. "Master has spread Falun Dafa to more than 100 countries, giving benefits to countless people. They all say that Falun Dafa is good. However, the evil Communist Party members are persecuting Falun Gong and imprisoning practitioners. They even harvest the organs from living Falun Gong practitioners for profit. The heavens are watching people’s actions. Good will always be rewarded and evil must face retribution," she told the tourists. Over the years, many people gave their greetings to Falun Gong and Mr Li Hongzhi, saying, "Falun Dafa is good! Truthfulness-compassion-forbearance is good!" The Epoch Times published the editorial series, "Nine Commentaries on the Communist Party" in November, 2004. It deeply exposed the evil nature of the CCP and triggered a tide of "three withdrawals"—to quit the CCP and its affiliated organizations. In 2005, volunteers formally established The Global Service Center to Quit the Chinese Communist Party. To date, more than 230 million people have withdrawn from the CCP and its affiliates. During the summer of 2015, Ghazal joined the "Ride2Freedom" campaign with 25 youth from 15 different countries. They cycled across the U.S. to call attention to the persecution of Falun Gong and help Chinese children who were orphaned through the persecution. The event received a lot of support from politicians and entrepreneurs, as well as media coverage. This year's Fa conference was part of the 17th anniversary celebration for "5‧13 World Falun Dafa Day". This year it became the biggest Falun Dafa activity to take place overseas. Around 10,000 Falun Dafa practitioners gathered in New York for group exercises, cultural performances, rallies and a parade, astonishing people in Manhattan.